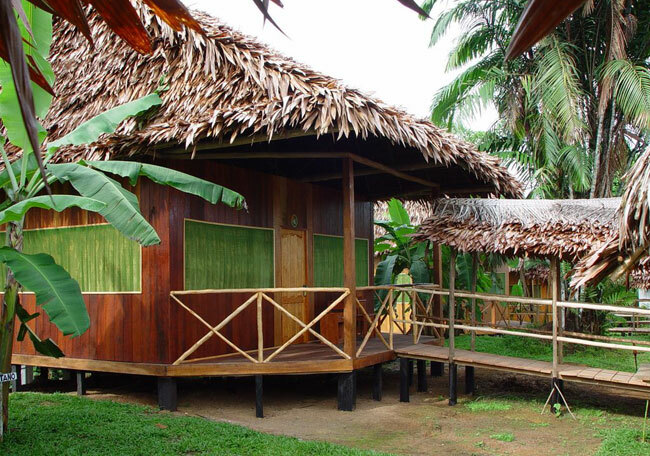 Amazon Rainforest Lodge is a family lodge: children are welcome, youngsters, adults, everybody. We have two bungalows for movement impaired persons. All the walkways are on just one level so that a wheelchair can be used anywhere. 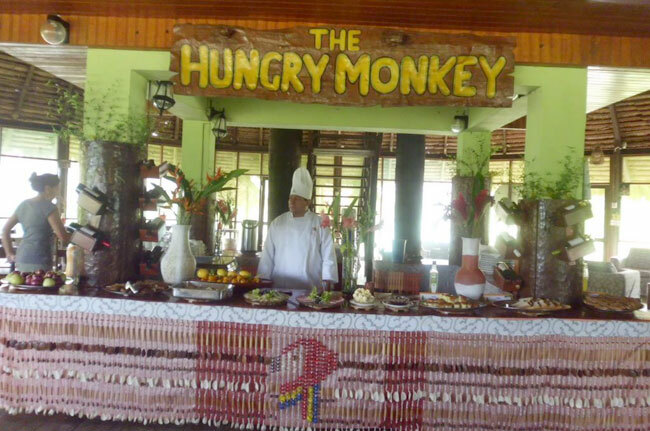 We have delicious fresh food, a mixture of local and international, prepared by our wonderful chef, great drinks both local and international, prepared by our great barman, and snacks available between meals from our kiosk. 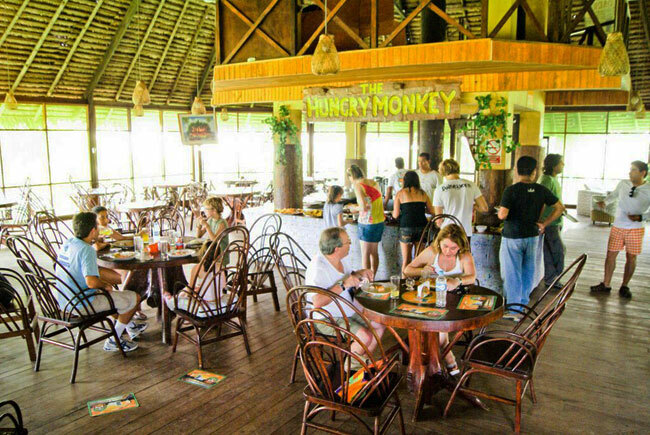 Although we are a ‘jungle lodge’ we try to provide as many facilities as a good hotel would also provide (internet connection, Direct TV, etc). 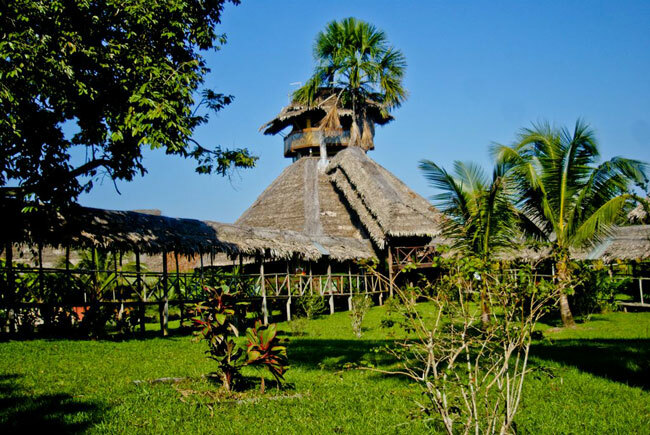 Amazon Rainforest Lodge is located on the banks of the Momon River, only a 45-minute boat trip from Iquitos City. Just one thing: Remember that we are in Secondary rainforest so unfortunately you will not see any large animals in our area, but we do have around 60 species of birds flying around. I highly recommend the early morning (dawn) boat tour where you will see all the birds and small animals in all their glory. 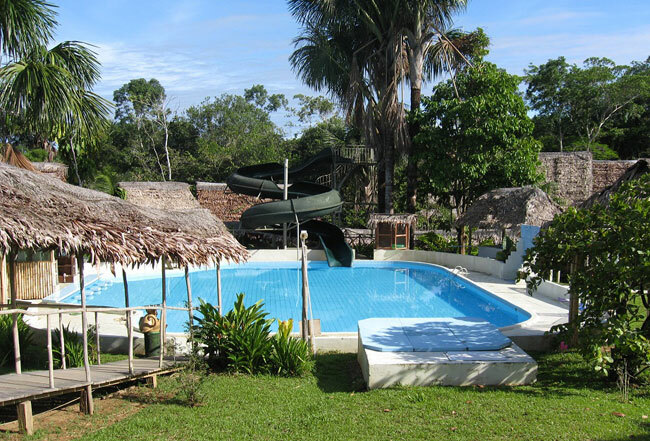 The biggest attraction is our swimming pool which is by far the largest in the Peruvian jungle, also the longest water slide (34 meters) in the jungle, with fresh water coming from an underground well. Whilst digging for water we found a whole layer of ancient fossil fish and sea shells which means that millions of years ago this whole area was underwater!! So after your trek through the rainforest a dip in the pool will refresh you! If you want to just relax then just enjoy sitting in one of our many hammocks scattered around the area. For kids we have the ‘Sapo’ (frogs) game which is a lot of fun, plus TV's with games in each of the bungalows, a kids’ pool, swings, and trampoline. Besides the treks and canoe boat rides, there are sporting facilities. For example when groups of youngsters arrive they sometimes play football (soccer) against the local teams from the nearby villages of Gen Gen and Centro Fuertes. Recently I acquired a large piece of land about a 12 minute boat ride down the Momon River towards Iquitos. It is called ‘Piranha Park’ and with much care and love we have built five artificial lakes. One has piranhas which you are welcome to fish (mind your fingers! ), another has crocodiles (all fenced in), we have an iguana compound, and our very own monkeys which live on a small island with plenty of trees to play in. There is a 1.4 km jungle trek which includes a large tree with swings, and a shorter route where you can see orchids in their natural glory. 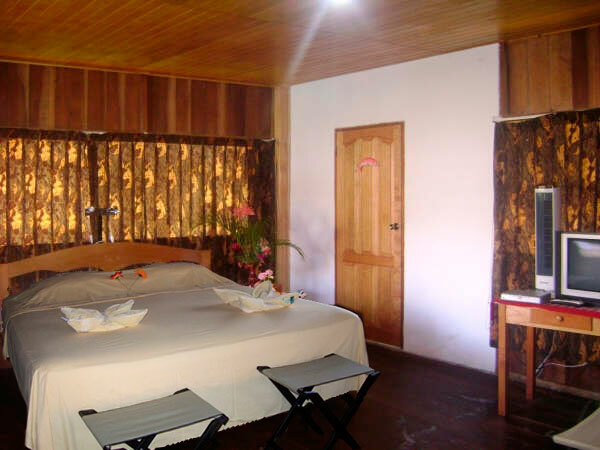 Rooms at Rainforest Lodge feature cable TVs and seating areas. Wooden ceilings and curtains with flower themes create a warm ambiance. A buffet breakfast is daily served. The restaurant boasts a panoramic river view and prepares regional dishes. Drinks, cocktails and Peruvian beers can be ordered at the bar. Arrival in Iquitos City has to be before 9 am. and departure after 5 pm. Other schedules has to arrange extra boat with additional cost. Includes: Transfer by private transport from the airport or hotel to the pier indicated Nanay / hotel / pier Nanay / airport or hotel, shuttle water-slider or Pamacari (depending on number of passengers), tour in the Iquitos´city, jungle excursions, accommodation: during the stay in Amazon Rainforest Lodge with full board, permanent guide.